The Water Wick Planter is a very unique self-watering planter system (also known as garden planters or outdoor planters or flower planters or plastic planters or deck planters or patio planters or decorative planters or hydroponic pots of self watering pots) that is ideal for home office, lobby, porch/patio, weekend cabin or lake house. Perfect gift for the person who travels or has everything. There is nothing on the market like this innovative design. 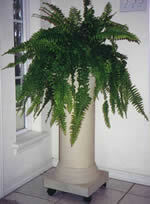 The self watering planter is designed in a classic column styling that will match most any décor. The plant lifts water from the two and a half-gallon reservoir in the column via capillary wicking action. As the plant needs more water, it automatically draws more, making it impossible to over-water your plant, which is one of the most common reasons for mortality of plants. The large reservoir allows for extended periods of no maintenance. It is recommended that the water in the reservoir be changed out every two months whether it is low or not. This keeps it fresh and ensures continued health of your plants. The plant draws its nutrients and water from the water reservoir, so it is good to use a light solution of water soluble plant food every two to three months, to give the plant the necessary nutrients. The smooth finishes offered are green marble, taupe/black granite and black granite. The planters are 28" tall, with an 11" wide planter pot to accommodate almost any household plant. The system comes complete with instruction for planting, planter, perlite growing medium. All you supply is your plant, light and water. (Also known as garden planters or outdoor planters or flower planters or plastic planters or deck planters or patio planters or decorative planters or hydroponic pots of self watering pots). Offering Wedding Columns, Prom Columns, Decorative Columns, Display Fixtures, Display Pedestals, Display Stands, Faux Columns, Plastic Columns, Wedding Props, and Outdoor Planters. Check out our Decorative Column, Display Columns, Display Fixture, Display Pedestal, Display Stand, Wedding Prop, and Outdoor Planter line of products. We not only produce all types of Display and Fake Roman Columns but also Self Watering Planters.